When it comes to rats, even scientists can get caught up in the blame game. For you see, in the case of the most common, the brown rat, its species name (Rattus norvegicus) is really a misnomer. No one knows why this became the accepted nomenclature, though perhaps, English naturalists first wanted to pin it on the Norwegians—-even though there was no evidence they ever came from Norway. It may have been for a good reason to avoid blame for the spread of rats, since the brown rat has long been a reservoir for zoonotic diseases like Hantavirus (though it was their genetic cousins, black rats (Rattus rattus), that caused the plague). Now, an international research team of more than 20 institutions has performed the largest, whole genome DNA sequencing of 110 wild brown rats from across the world. The new study, published in the advanced online edition of the journal Molecular Biology and Evolution, has revealed that brown rats originally migrated "Out of Asia" from southern East Asia about 3,600 years ago, rapidly spreading, first into the Middle East, and then to Europe and Africa. 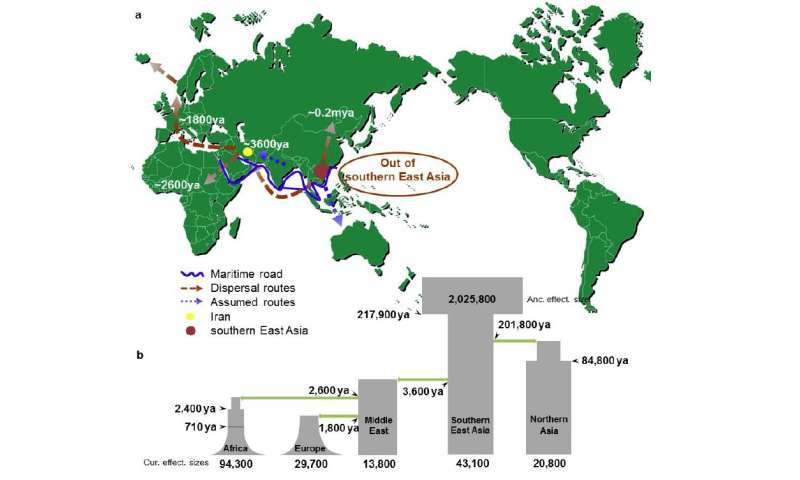 "We provided evidence for an out of southern East Asia origin for the brown rat and its subsequent dispersals to the Middle East, Europe and Africa thousands of years ago," said the team leader Ya-Ping Zhang, of the Kunming Institute of Zoology in China. "Along with the migration, we have also identified many genes involved in the immune response that have adaptively evolved under natural selection in the wild rats." Using a suite of genetic analysis methods, the research team constructed a rat evolutionary tree using almost 25 million individual DNA variants, or autosomal single nucleotide polymorphisms (SNPs), that were identified in their genome dataset. From the data, they found that brown rats from outside Asia clearly exhibited closer genetic relationships with rats from southern East Asia (including Southeast Asia and southern China), then to those from Northern Asia (including northern China and Russia). "This was further confirmed by a haplotype sharing analysis, where the "Out-of-Asia" rats showed more proximity to southern China rats than those from northern China," said co-author Hai-peng Li. They could also more precisely pin down the statistical estimates of the timing of brown rat migrations. Their detailed analysis indicated that brown rats migrated from southern East Asia to northern Asia about 200,000 years ago. From there, they made one wave of migration north, then another wave to the west. Brown rats spread from South East Asia to the Middle East about 3600 years ago to Africa ~2600 years ago and to Europe ~1800 years ago. The estimated introduction times of brown rats to Europe are much older thanhistorical reports that propose migrations in the 18th century, and the origins of the Norway rat name. The authors speculate that ancient maritime trade routes and human migrations may have been responsible for the spread of rats across the globe. "Maritime trade has been in existence in the Indian Ocean and southern East Asia region for over 4,000 years. These early human activities could have facilitated the migration and dispersal of brown rat from southern Asia to other regions. Such kind of human-assisted migration was often proposed for rodents," said another co-author Dong-Dong Wu. Next, from their comparison between different geographical populations, the team revealed many genes involved in the immune system also experienced positive selection in the wild brown rat. "During dispersal, wild rats have transmitted and spread devastating diseases to human populations," said Dong-Dong Wu. "This property of rats, allowing them to host many pathogens, has long remained a puzzle. An "arms-race" that drives the rapid evolution of the immune system in a host might have endowed rats with this potential." The top two clusters with the highest level of differences between Chinese and European rats were across immune genes Mgat5 and Lyst. The gene Mgat5 is thought to be involved in T-cell proliferation, while mutations in the Lyst gene causes the Chediak-Higashi Syndrome in humans, a genetic immunodeficiency disease where T-cell and natural killer cell cytotoxicity become defective. Next, they hope to follow up their computer data and validate the immune system genomic hot spots with additional experiments. These immune system adaptations may also help explain why, next to humans, rats have become the most successful mammals on Earth, inhabiting every nook and cranny -and every continent ——except Antarctica. For wherever people go, rats will surely follow. And now with the new study, perhaps, a species name change will finally be in order too.